A 2 photo panorama of the Snowy River at Dalgety, New South Wales. The Snowy River looks quite idyllic at this point, but that is only because it is enlarged by a small weir just to the left of the photo. Most of the length of this once picturesque river is a mere muddy trickle due to a huge post-WWII hydro-electric power scheme diverting 99% of its original flow. The power scheme was and still is an engineering triumph but an environmental nightmare. This looks like a nice spot for a picnic! Very nice work Ollie! Nice shot Ollie. Makes me want to have a nice snooze under a tree in such an idyllic setting. To bad about the dam changing the landscape. We have many dams in our province, as we are one of the major hydo electric providers for the western U.S., and they do change things to the detriment of the environment...cheers....Don. 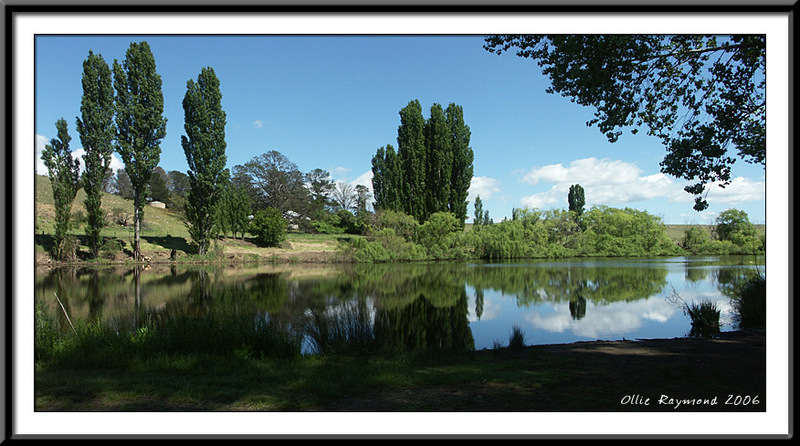 A beautiful photo ollie, I like this, I can see me sitting on the bank with my fishing rod,excellent.